Owning a mobility scooter can be fun while at the same time making your movements easier. These mobility machines are especially ideal for people with limited mobility as they are able to help them regain their ability to move around independently without restrictions. However, choosing the scooter should be done wisely as this will determine whether you will be able to enjoy your machine or not and whether it will serve the purpose for which you purchased it. Where you will be using it: – Mobility scooters are designed to be used both indoors and outdoors. Depending with where you will be using the scooter, it is important select one that is capable of maneuvering the layout without giving you trouble. In case your you are buying a scooter for use inside the house, consider the space available and buy one that will be able to move along the corridors and through the doors with ease. Consider your weight and height: – Scooters are built to handle different kinds of weight and each will be suitable for people of different heights. Heavy duty scooters are capable of handling approximately 400lbs while lightweight ones are capable of handling approximately 250lbs. It is good to confirm the manufacturer’s specifications before buying to ensure that your choice will serve your appropriately. Additionally, make sure that the mobility scooter of choice is comfortable allowing you sufficient space for your legs. Your cruising distance: – Mobility scooters are built with the suitability to cover different distances. Depending with your cruising distance, you may need to look for a scooter that is capable of taking you there without trouble. For example, if you need to travel to town or use the scooter in a golf course, then you might find a heavy duty of medium scooter to be the most suitable option for you. In case you do not intend to use the scooter for long distances, then you might find a small one to be ideal as it allows you to cover approximately 10 miles comfortably. Battery life: – Depending with the distance you would be covering with the scooter, battery life should be a factor to consider. 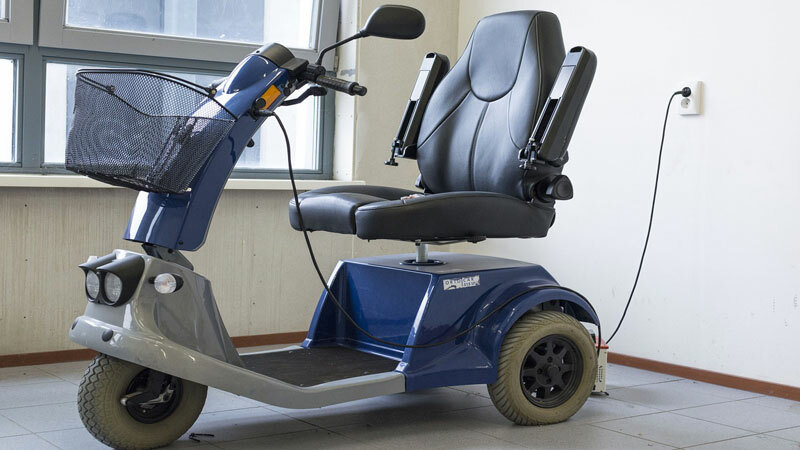 Some mobility scooters are made to cover more miles than others and therefore come with batteries that can last longer than others. Foldable and lightweight models are made to cover short and frequent distances and therefore come with batteries that are capable of covering approximately 30 miles. Your available storage space: – Your mobility scooter will need storage space whenever not in use. This is a factor you must consider carefully and therefore you might need to select one that is easy to dismantle or fold for storage purposes. Mobility scooters are available in 3 and 4 wheels and this is also something you might need to consider. While either will be okay, 3-wheeled scooters come with an added advantage when it comes to maneuverability. However, 4-wheeled units are stable and elicit more confidence when cruising through uneven and rough terrains. The cost might also be an important factor to consider but this should come as the last factor if you are satisfied with all other considerations.